The school environment is the main setting for educational instruction. Mariette Visser and Andrea Juan examined the resources, both tangible (school environment) and intangible (school climate), that influence school performance. They found that around 95% of grade 9 learners in the sample group were affected by inadequate educational resources at school. What is the effect of well resourced schools on mathematics performance? What is the effect of a safe, orderly and disciplined school climate on mathematics performance? Tangible elements of the school environment refer to physical resources. Schools with physical assets and infrastructure, such as libraries, laboratories and computers, exhibit more positive educational outcomes, while indicators of inferior infrastructure and assets tend to be negative. In South Africa, 95% of learners were affected by inadequate resources for mathematical instruction at school (Table 1). The average achievement of South African learners (510) that were not affected by resource shortages was higher than the international average (488), but such conditions applied to only 5% of local learners. Classrooms and grounds are clean and well maintained. Areas for instruction and activities are appropriate for those uses. An index called the School Discipline and Safety Index was developed from the responses of principals to 11 items in the school questionnaire. The items included problems with the following issues: arriving late, absenteeism, classroom disturbance, cheating, profanity, vandalism, theft, intimidation or verbal abuse among students (including texting, emailing etc. ), physical injury to students, intimidation or verbal abuse of teachers (including texting, emailing etc. ), and physical injury to teachers or staff. It is evident from Table 2 that South African schools experienced many safety and discipline problems. Only 4% of grade 9 learners attended schools with hardly any problems. Almost all South African grade 9 learners (96%) experienced problems with discipline and safety at their schools. It is also evident from Table 2 that an unsafe and ill-disciplined environment had a negative effect on learner performance. The average achievement score for South African learners dropped from 406 points for schools with hardly any problems to 345 points for schools with only moderate problems. Comparison with international figures revealed that four times fewer learners (4%) in South Africa attended schools with hardly any problems compared with 16% of international learners. Additionally, more than twice as many South African learners (41%) attended schools in the most affected category of the School Discipline and Safety Index than international learners (18%). 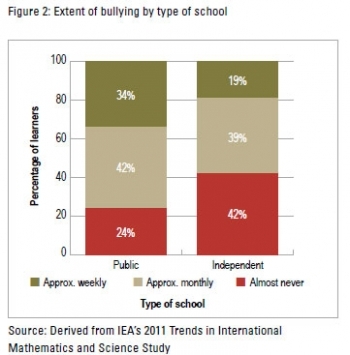 An alarming finding from the study concerned bullying at school. Learners in South African schools are suffering physically and emotionally from schoolyard bullying. An index called Learners Bullied at School Index was developed from six questions posed in the learner questionnaire. The questions explored how often the learner had been made fun of or called names, was left out of games or activities by other learners, had had someone spread lies about them, had had something stolen from them, had been hit or hurt by other learners, and was made to do things that he/she did not want to do by other learners. Almost three times more learners (33%) were exposed to bullying on a weekly basis than the international average (12%). More than half (59%) of international learners had almost never experienced bullying at their schools, while three in every four learners (75%) in South African schools experienced bullying on a monthly or weekly basis. 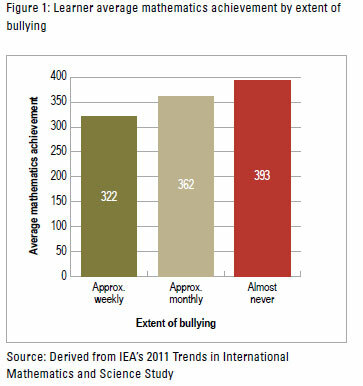 It is further evident from Figure 1 that bullying had a negative effect on learner performance in mathematics. In addition, the study revealed that independent school learners were less affected by bullying than public school learners (Figure 2). Almost half (42%) of independent school learners – compared to one in every four (24%) public school learners – had almost never experienced bullying. A favourable school environment for teaching and learning must have efficient and effective management procedures and practices; motivated, competent and satisfied teachers; sufficient facilities, books, technology, teaching and learning materials; and motivated, healthy and disciplined learners. The study showed that on average, most of South African learners were deprived of some or all of these aspects when compared with international standards. It was also evident that the performance of South African learners compared well with international averages in all instances where learners were exposed to favourable school environments. Authors: Mariette Visser, Research Manager, and Andrea Juan, Researcher, Education and Skills Development research programme, HSRC. The HSRC remains a trendsetter in the dissemination of research-based information. One of the vehicles for this activity is its widely distributed quarterly news magazine, the HSRC Review, which contains accessible articles of recent research outputs, success stories of collaborative projects, and projects involving capacity development at community level.